Geology in Motion: How much power in the Japanese tsunami of 2011? How much energy? Equivalent to how many nuclear bombs? 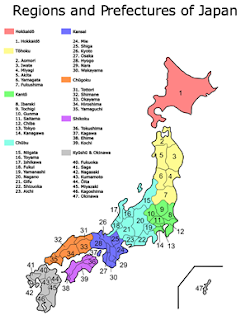 The Island of Honshu, Japan, is divided into five region, each of which contain sub-units called Prefectures. The regions are: Chugoku, Kansai, Chubu, Kanto, and Tohoku. The two most northern ones are Tohoku (yellow) and Kanto (green). The two cities that we have heard mentioned the most are Sendai and Tokyo, which lie in these two Prefectures, respectively. The island of Honshu has a coastline of 5,450 km (3386 miles). I am trying to estimate the magnitude of effort that it's going to take to remediate and help reconstruct Japan. Important: These numbers may change by factors of ten as new data and rigorous analyses come in, and they are not even internally consistent, but I think that it's important for the world to take notice now--while the spotlight is on--of the magnitude of the task faced by the Japanese, and us with them--to recover from this tragedy. I will revise these continuously as I get new input, and feedback from readers. If you use the numbers below, please give credit to this site! The power of a tsunami is a measure of energy per unit time. It was first defined back in the steam ages in order to compare steam engines to working draft horses. There's an excellent review of this history on Wiki under "horsepower." The power of a tsunami is the rate at which the kinetic energy in the tsunami is transferred to the shoreline. This means that the power of the tsunami along that shoreline was about 1.3 *10^12, or 1.3 petawatts. To get energy, we need to know the duration of the tsunami. Let's estimate 100-1000 seconds. This means that the total energy was at least 1.3 * 10^14 joules, or 31 kilotons, almost equivalent to the 36 (15+21) kt that destroyed Hiroshima and Nagasaki, combined. If the duration was on the long end of these estimates, or the waves higher, this number could easily be 310 or even 3100 kilotons, equal to 10 or 100 Hiroshima's and Nagasaki's. My "gut feeling" from looking at the number of completely devastated cities is that these higher numbers are very likely. 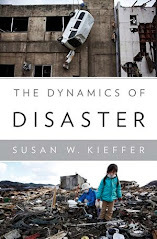 The frequency and magnitude of these events is sobering--Haiti, Chile, New Zealand, Japan, with inevitable big earthquakes and tsunamis in Turkey (Istanbul) and the mideast, and Cascadia in the future. Note added 3/13 at 2:45 CDT: Summary of factors that would reduce the above estimates: velocity may be lower than 200 m/s, and total length of coastline now looks as if it's less than 1300 km. Summary of factors that would increase the above estimates: higher wave heights (reports from Sendai that the wave was as high as the trees, but I don't know what type of trees were in Sendai. **Details of this estimate technique can be found at http://plus.maths.org/content/tsunami-1. I saw what appeared to be extreme liquefaction in the Tokoyo Bay area that was reclaimed with landfill- It brought up a thought about the general stability of Japan's underground infrastructure at this point. What are the "odds" of general liquefaction in Japan?